Thai traditional costumes vary by city and the ruler of each historical period.Thai clothes can be classified according to six distinct periods of history; beginning with the 11th Buddhist century. Previously, traditional Thai clothes were worn daily; however, they are now only worn on auspicious functions such as Thai traditional marriage ceremonies. Tavaravadee began in Buddhist century 11-16. During this period the north city Tavaravadee ruled the country. The style was influenced by the Indian style that used colored stones as accessories. Men's clothes during that time the pants were similar to Indian loincloths with a silk top or no top. Accessories were golden necklaces and metal belts. On women's clothes the tops were usually one cloth brace on the shoulder or tightly wrapped around the breasts with a long skirt from waist to ankle. Accessories were similar to those of the men. Lopburee started at the end of Buddhist century 16-19. This period was ruled by the Lopburee. Fashion was influenced by the Khmer.Men's clothes were short sarongs worn tight around the waist about knee length with a metal belt. Women's clothes were sometimes without top or a cloth wrapping the breasts, with a short sarong. Both ends of the sarong came together in the front to look like a stripe. Sukhothai became the fashion in Buddhist century 19-20. The city of Sukhothai united the cities which were ruled by different kings.Men's clothing was a simple full sleeved top with a long V shape neck and a cloth brace on their shoulders. The loincloth was made of silk with a big metal or golden belt. Women's clothing was a long silk sarong with flowers painted on it. The top normally is a full sleeved silk cloth. Married women wore one cloth wrapped around the breasts made of silk or other fabric. Ayudhaya was the style during the end of Buddhist century 19-21. Ayudhaya was the capital for 417 years, the longest period since Thailand was under one king. Men's clothes were loincloths mostly without top or a turtleneck with full sleeves. Women wore t-shirts with short sleeves made from silk, breast cloth, with long skirts made from any fabric. Thailand Traditional Dress Traditional Thai dress varies across both social classes and regionally, and the most wide-spread item is the tube-skirt. 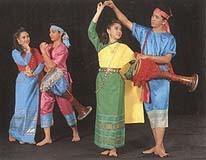 The classical costumes, however, are derived from the court during different periods of Thai history. As this history has involved considerable influence from neighboring peoples such as the Khmer, Lao, Burmese, Malays and even Indonesians, it is not surprising that the costumes themselves are related.